Atul Gawande impressed me again, with his humble, personal, yet well-informed writing with Being Mortal. We all have things that are most important to us come the end of life, but few are willing to think about it. In the rare chance we do think about it, few have the vocabulary, support, or resources to flesh out these priorities and what it actually means to attend to them in at end of life. Gawande explores this phenomenon, it’s origins and manifestations, as well as the ways people are doing it right. I highly recommend this book to everyone. And talk about your own death, even if you are young. Sure, most likely we will live a long life, but we are all but one sudden car crash away from living out that long life as a vegetable. We need to think about, talk about, and plan this inevitable stage of our lives. I never understood America’s obsession with longevity. Maybe it was my early fascination with ancient Egyptian culture and it’s reverence towards death. Maybe it was because at a very young age I lost two young uncles who lived very full lives. Maybe it was because my mother worked as a hospice nurse and took the heavy weight of her responsibility home with her. Whatever it was, I just didn’t understand why longevity was so important. 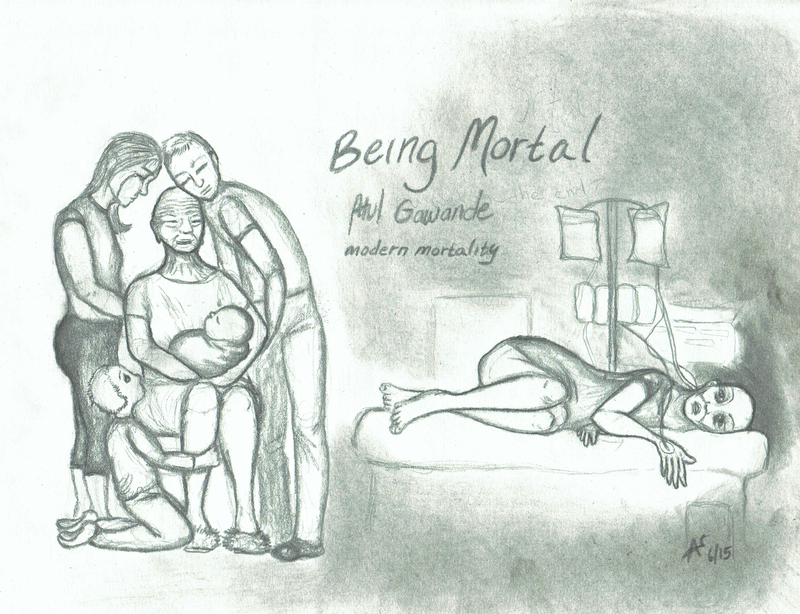 I by no means intend to devalue the importance of lives, or the grief that comes with mortality. No one wants to die, but it is the only certainty for all of us. Why fear so much something that is bound to happen to every. single. being. that. ever. lived? As medical technology improves, our ability to keep someone technically alive for longer periods has only improved. But, just as I feel comfortable putting a dollar limit on preserving the life of a pet, I feel just as comfortable putting a dollar limit on preserving the life of a person (albeit quite a bit more, respective of life expectancy). This obsession with preservation (it’s not life at this point, it’s preservation) is exhausting resources the ability for others to live full lives, and risks the potential to do more so as our economy strains and medical expenses continue to skyrocket. However, I wonder if the tables might just start turning, and this book has the power to drive that tipping point. To all of us who have lost loved ones, my heart aches for you. Excellent recap on a topic so many of us avoid, although it is the one unavoidable thing. Fantastic picture by amandaeve.